In 1956, Sherry Lee recorded her first single on Mar-Vel Records based in Hammond, Indiana. On the Mar-Vel label, their singles bore the motto: “Hits of Tomorrow Recorded Today.” Mar-Vel Records had her billed as “Sixteen year old Miss Country Music” on the label credits. Lee was described as a confident young girl with a clear, warm voice. The single, “Baby Honey”, featured Sherry Lee attempting a fast paced country waltz with ringing steel guitar behind that got out of synch with the rhythm with each successive verse. Then, in 1958, Jackie Dee recorded two songs she wrote in Nashville. The “Strolypso Dance” was a tune that borrowed from both Brenda Lee and Paul Anka in vocal style. The song was set to a beat that could be danced to either The Stroll or Calypso. The other tune, “Buddy,” imitated Brenda Lee and got Jackie Dee some attention on a few radio stations. After Liberty Records released this single, Jackie Dee switched to Fraternity Records to release “Just Another Lie.” But this time she the song was credited to Jackie Shannon and The Cajuns. Then in 1959, Jackie Shannon released “Trouble”, a song featured in the Elvis Presley film King Creole. This time she appeared on the PJ label. Several more releases in 1959 appeared on Edison International under the billing of Jackie DeShannon. After one more single release with this label, she switched back to Liberty Records. In 1961, she moved to Hollywood. 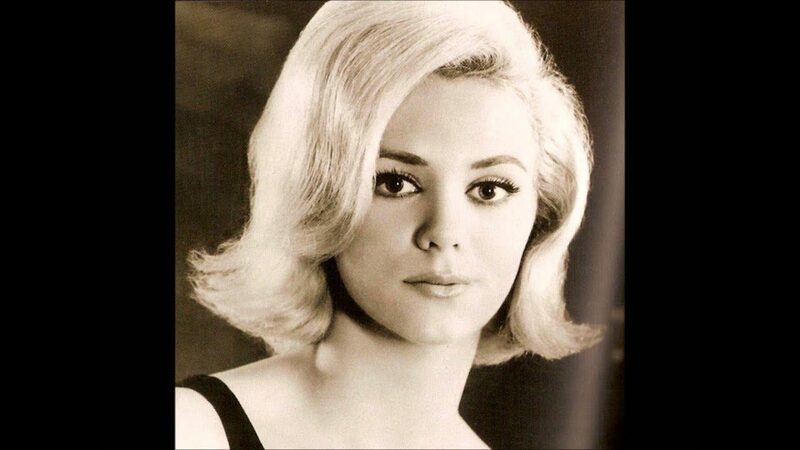 In 1965, Jackie DeShannon switched labels again and had a Top Ten hit in the USA with “What The World Needs Now Is Love.” The song climbed to #6 on CKLG in Vancouver. While the sales from the single were auspicious, Jackie DeShannon wouldn’t crack the Top 60 again until 1969. Over the next few years she had little success with her commercial releases. But in Vancouver she continued to chart well. In September 1966 she made the Top Ten with “I Can Make It With You”. “I Can Make It With You” is a song written by Chip Taylor. Taylor was born in 1940 in Yonkers, New York, with the given name James Wesley Voight. His brother Jon became a very successful actor beginning with an Academy Award nomination for his performance in Midnight Cowboy in 1969. Taylor’s first successful hit as a songwriter was “Wild Thing” for the Troggs. He wrote “Wild Things” in 1965 and they took it to #1 in on the Billboard Hot 100 the weeks of July 30 and August 6, 1966. “Wild Things” topped the charts in Vancouver for three weeks from June 25 to July 9, 1966. Earlier in 1966, Taylor penned “I Can’t Let Go” which became a #1 hit for the Hollies in the UK and climbed to #16 in Vancouver in the April ’66. And in September ’66, Chip Taylor’s “Make Me Belong To You” was a Top 20 hit in Vancouver for Barbara Lewis. In 1968 Chip Taylor’s “Angel Of The Morning” became a Top Ten hit for Merrilee Rush & The Turnabouts. Aside from penning songs for other recording artists, as a country singer, Taylor released twenty-five studio albums between 1971 and 2017. In the ’70’s Chip Taylor had five singles enter the Billboard Hot Country Songs chart. Chip Taylor’s album Yonkers, NY earned him a Grammy Award nomination in 2011 for best recording package. However, The Black Keys won the Grammy for their album Brothers. Chip Taylor was inducted into the Songwriters Hall of Fame in 2016. 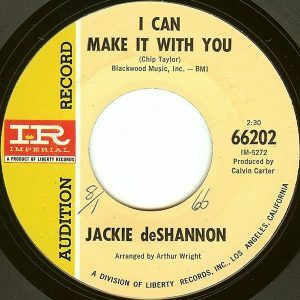 “I Can Make It With You” was recorded first by the Pozo-Seco Singers and shortly after by Jackie DeShannon. The Pozo-Seco Singers version was upbeat compared to the overproduced and slower tempo DeShannon version. The Pozo-Seco Singers were the only ones to take the song into the Billboard Top 40, peaking at #32, while Jackie DeShannon’s version stalled at #68. In Vancouver, both versions of the song climbed the CKLG chart in tandem. Her version climbed to #7 in San Bernardino and Palmdale (CA). But it disappointed in most other radio markets. While the Pozo-Seco Singers version of “I Can Make It With You” climbed to #1 in Omaha, #3 in Bakersfield (CA) and Grande Prairie (AB), #4 in Detroit and Orlando, #5 in Windsor (ON), #6 in Houston and Salt Lake City, #7 in Akron (OH) #8 in Milwaukee and #9 in Newport News (VA) and Wilmington, Delaware. Jackie DeShannon’s followup single release was ”Come On Down (From The Top Of That Hill)”. It stalled beneath the Billboard Hot 100 at #121. But in Vancouver, the tune reached #13 in February 1967. In 1968 her version of “The Weight” climbed to #16 in Vancouver and #55 on the Billboard Hot 100. Despite her being from the USA, DeShannon often had better chart runs in Vancouver. In 1967, Jackie DeShannon appeared in a college-themed film titled C’mon, Let’s Live A Little. She co-starred with Eddie Hodges and Bobby Vee. In 1969, she had her biggest hit, “Put A Little Love In Your Heart,” which climbed to #4 on the Billboard Hot 100. After the sixties, DeShannon turned to songwriting for other recording artists. He biggest success was with “Bette Davis Eyes,” a #1 song recorded by Kim Carnes in 1981. Between 1963 and 2000, she recorded twenty-one studio albums and was featured on two soundtrack albums. Fast Forces of Attraction, Psychology Today, January 1, 2008. Nick Paumgarten, The Chill, The New Yorker, July 7, 2008. Chip Taylor inductee bio, Songwriters Hall of Fame, 2016.